This "Historically Speaking" column was published by the Exeter News-Letter on August 26, 2016. There is not a theater program out there that has not been used as a hand fan. A small folding fan used to be a necessary accessory that every woman carried. Before we had air conditioning fans were necessary to provide a cooling breeze for women who wore long layered corseted dresses. And as often happens with accessories, they became useful in other ways. As a means of communication, a fan could be used to convey a wide variety of information and emotions. “Women are armed with fans as men with swords, and sometimes do more execution with them,” commented Joseph Addison in a 1711 edition of The Spectator. His humorous essay sought to create a militia of ladies trained in the proper use of the fan. “There is an infinite variety of Motions to be made use of in the Flutter of a Fan. There is an Angry Flutter, the modest Flutter, the timorous Flutter, the confused Flutter, the merry Flutter, and the amorous Flutter. Not to be tedious, there is scarce any Emotion in the Mind which does not produce a suitable Agitation in the Fan; insomuch, that if I only see the Fan of a disciplined Lady, I know very well whether she laughs, frowns, or blushes.” His essay, and others written afterward, are frequently used as proof that there was a ‘language of the fan’ that was understood by all, but this is most likely apocryphal. One of the more unique aspects of the hand fan was that it was one of the few accessories that a woman could not produce herself. She couldn’t sew or knit or weave herself a fan. It was an article that had to be purchased. The cheapest fans were made of palm leaves. These were utilitarian fans to keep around the house. They didn’t fold and were probably useless for flirting. Montgomery Ward sold palm leaf fans at eighteen cents a dozen. The Exeter Historical Society has several palm leaf fans in the collections and they are deemed so dull we rarely put them on display. So too are the advertising fans handed out by local merchant that are merely pieces of cardboard with a printed picture glued on a stick. 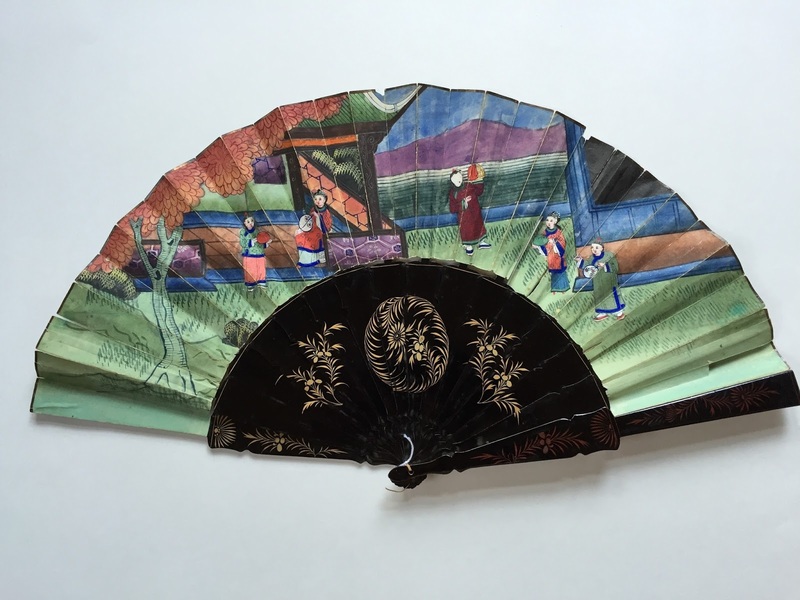 The truly beautiful fans in our collections are those in the Perry Dudley Collection donated between 2000 and 2003. Twenty-three elegant fans were entered into the archives with basic descriptions such as, “red fan with black supports.” Really, was any more information needed? Occasionally, the fans have been displayed at the public library or RiverWoods, but quite frankly, we knew very little about them. A few other fans in the collection, from the Tuck Family, rounded out our holdings, but of these we also had very little information. 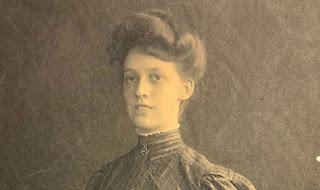 Enter the heroes of our story: Exeter Historical Society members Viki and Katherine Lukas. Who, along with fellow members of the Fan Association of North America, visited on a chilly day this past March day to turn their expert attention to our collection. Most of our fans date between 1870 and 1900. They were produced in a multitude of countries - Japan, China, France, Italy and Germany -, reflecting the upper-class status of the family. Some were likely purchased as souvenirs while others were imported. In Exeter, fans were purchased at the jewelers shop. In 1877, William Currier, dealer in watches, clocks and jewelry on Water Street, advertised “the finest FANS made” for sale at his shop. Maybe Frances Perry Dudley purchased her white goose feather fan from him. Or perhaps she brought her white silk fan with bone sticks and guards back from a grand tour of Europe. Julia Tuck, the wife of banker Edward Tuck, purchased her exquisite mother-of-pearl and lace fan in Paris, where she lived most of her adult life. The small group of fan experts became delighted each time another fan was carefully unwrapped. Among the most exciting finds was a late-1800s Mandarin style fan made for European export. The fan is decorated with five large style figures with ivory faces and applied fabric costumes. This type of fan is commonly known as a “hundred face” fan, as some of the more elaborate examples have dozens of characters on them. It’s a real treasure to have one within our walls. The collection is currently on display in the museum room of the Exeter Historical Society, along with a few more contemporary fans. Mrs. C.A. White, when writing of fans in Godey’s Lady’s Book in 1854 mused that fans were terribly ordinary, but nonetheless worthy of note. “Trifles make up the pith and marrow of all that is useful and interesting in the world’s history,” she wrote. And that is something I’d like stitched into a needlepoint pillow. Members of the Fan Association of North America, L-R: Vicki Lukas, Linda Rousseau, Katherine Lukas and Shelly Goncalves, explore the collections of the Exeter Historical Society. Mandarin export fan, and example of a “hundred faces” fan. The figures are created with fabric costumes and painted ivory faces. 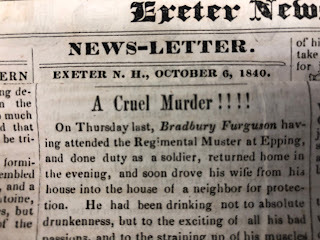 The Exeter Historical Society at 47 Front Street, Exeter, is open on Tues and Thurs from 2:00 – 4:30 and Saturday morning from 9:30 – Noon.